University And Biotech Firm Team Up On Colorblindness Therapy : Shots - Health News Six years ago, husband-and-wife scientists used gene therapy to cure colorblindness in monkeys. Now they're trying to make it work for the millions of people with faulty color vision. 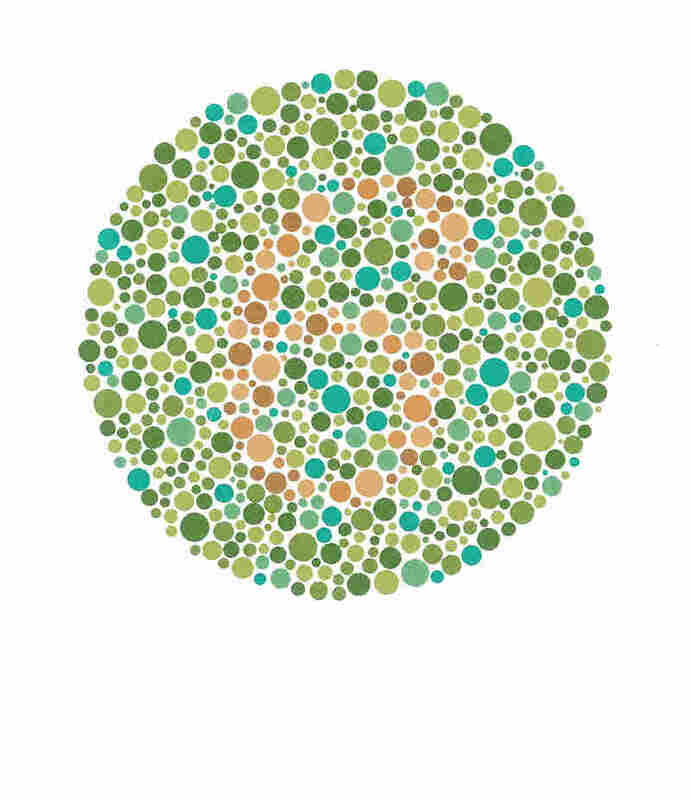 A simulation from the Neitz lab of what colorblindness looks like, with normal color vision on the left and red-green colorblindness on the right. "Our goal is to be treating colorblindness in clinical trials in patients in the next one to two years," says Thomas Chalberg, the founder and CEO of Avalanche. 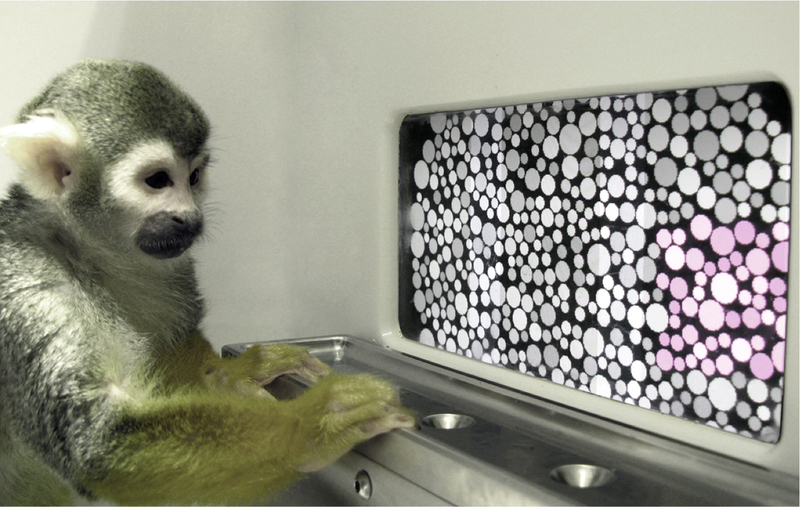 Dalton the squirrel monkey during the color vision test. The couple knew that transferring their success from monkey to man would be a challenge. But they were determined, says Maureen Neitz. "We've spent our entire careers writing NIH grants where we say our goal is to improve human health." 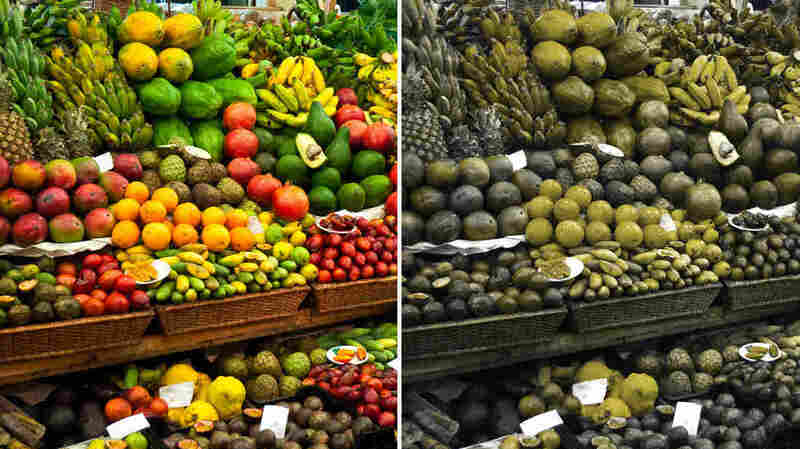 Colorblindness is usually a genetic disorder. About 8 percent of men inherit a mutation on the X chromosome that makes it hard for them to distinguish between red and green. The condition affects only about 0.5 percent of women, who have two X chromosomes. And color vision problems can be disabling. Emails arrive every day at Neitz lab with subject lines saying things like "colorblindness ruined my life," says Jay Neitz. The stories often come from people who say they are unable to pursue careers as pilots or fire fighters or even electricians, whose work involves a lot of color-coded wires. Colorblindness can also make it hard to do things like drive after dark, says Maureen Neitz. That became a big problem for her brother, who is colorblind, after his community switched from mercury street lamps, which give off bluish light, to sodium street lamps, which produce orange light. "He came home and he was shaking," Maureen Neitz says. "He said everything was just a sea of lights, it was all the same colors. (He) could not tell the street lights from the brake lights from the stoplights." Curing colorblindness involves delivering new genes to cells in the retina that respond to color. That's how Jay and Maureen Neitz cured the squirrel monkeys six years ago. But the technique they used required surgery on the retina, which is risky. For people they needed a nonsurgical approach, something that had eluded researchers for years. Then a team at the University of California, Berkeley found a way to deliver genes using a simple injection into the vitreous, the clear gel that fills most of the eyeball. Avalanche Biotechnologies has been working to improve and commercialize the Berkeley technique, says Chalberg. When he met Jay and Maureen Neitz at a scientific conference in 2012, he says, it was clear they could work together. It should be possible to begin experimentally treating patients within a couple of years, Chalberg says, because the human eye has proved to be a safe and relatively easy place to use gene therapy. "We like to say what happens in the eye stays in the eye, because it's kind of this small enclosed space." And a cure for colorblindness has the potential to help millions of people, Chalberg says. "People with this vision disorder have a very limited sensation," he says. "They can only see about 1 percent of the colors of a normal person. And so in some ways it's actually closer to being blind than it is to being sighted." What Do You See In These Dots? These slides are part of a common screening test for colorblindness. 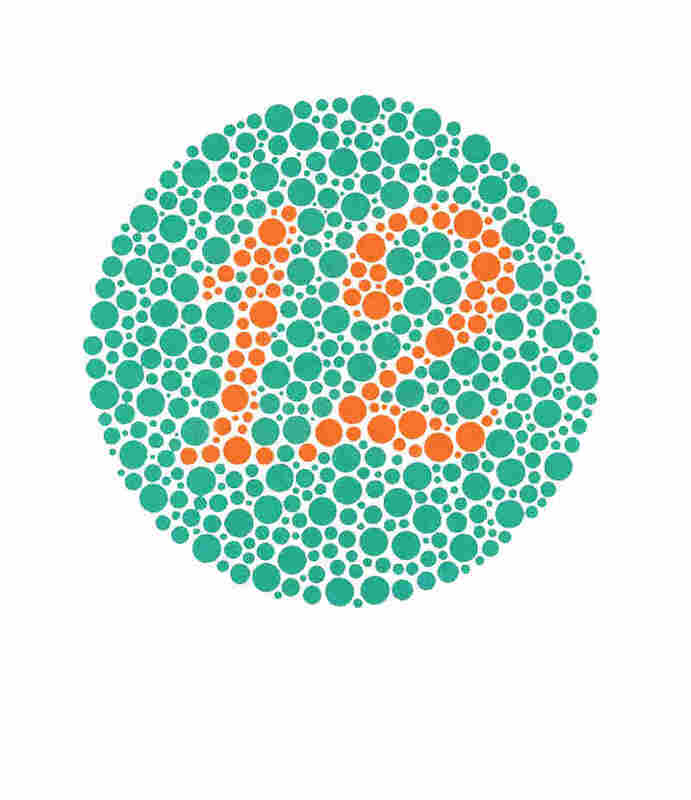 Viewers with normal vision and those with color vision deficiencies usually see the number 12 in this one. 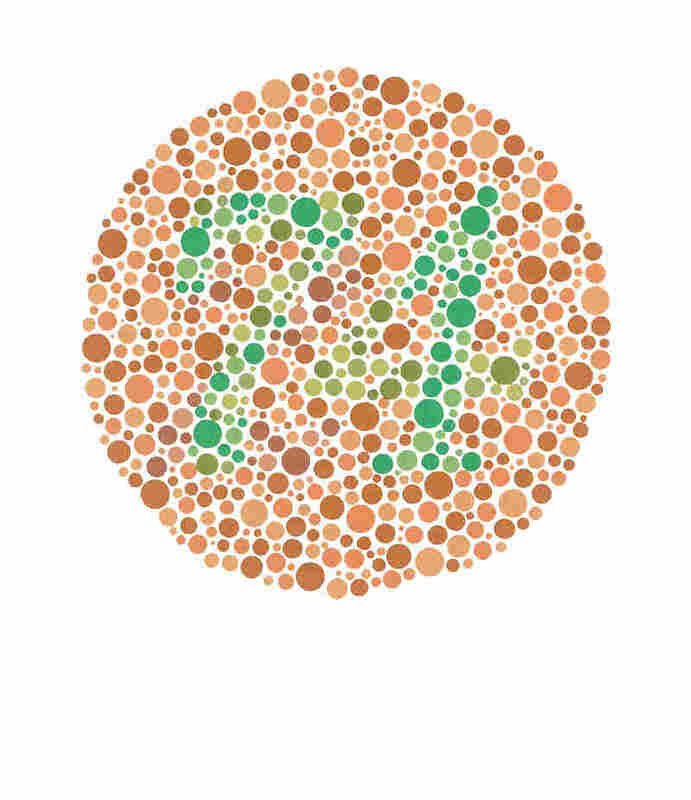 Viewers with normal color vision read the number in this circle as 74. Those with red-green deficiencies see the number 21. Those with total colorblindness don't see a number at all. Viewers with normal color vision read this number as 6. Those with red-green deficiencies read the number as 17. Those with total colorblindness don't see a number at all.